"From Pearl Lake," by Ralph Oberg. When: Tuesday, Jan. 17, through Friday, Jan. 27. Where: Paderewski Fine Art, 158 Beaver Creek Plaza, Beaver Creek. BEAVER CREEK — Dan Young was born in Denver and grew up in western Colorado. Working in the plein-air tradition, Young spends about 50 percent of his time painting on location, capturing the rural life of the West in scenes of the ranches that dot the mountain valleys and river bottom. Primarily a landscape painter, he likes to introduce hints of man’s presence in the landscapes. 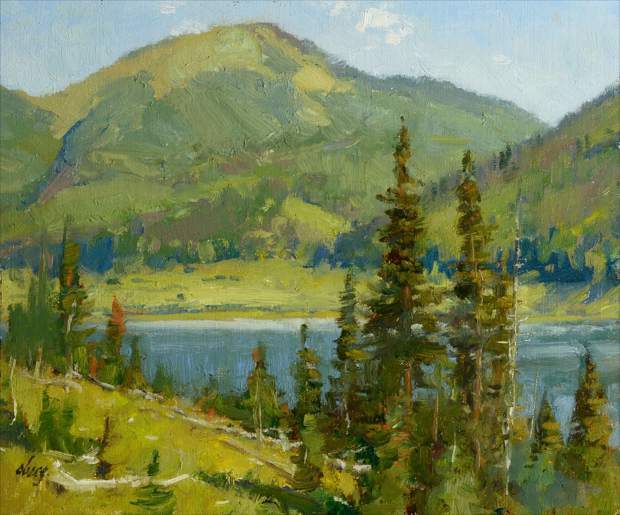 Also raised in Colorado, Ralph Oberg has focused on painting the landscape on location as a means of learning the colors and values of the natural world and how to capture a sense of moment and place for decades. His paintings can be seen in the House Chamber at the Colorado State Capitol Building, part of the permanent collection at the Buffalo Bill Historical Center in Cody, Wyoming, and in the Nature in Art Museum in Gloucester, England. Young and Oberg’s newest collections will be available to the public starting Tuesday at Paderewski Fine Art, located in Beaver Creek on the Plaza level of the Hyatt, across from the ice rink. Call 970-949-6036 or visit http://www.paderewskifineart.com for more information.